Do you know about little known company Mayur Uniquoters which is our 8-Bagger stock. We recommended this stock 3 years back at price of Rs. 56 (adjusted price after 2 bonus issues and stock split in last 2 years, actual recommended price was Rs. 448) and today it’s at Rs. 446 giving absolute returns of 697%. You might be surprised to know that Mayur Uniquoter is a 148-Bagger stock for investors who invested in it 6 years back. Investment of Rs. 1 lakh in Mayur Uniquoters in Jan 2009 is valued at Rs. 1 Crores and 48 lakhs today. That's too excluding dividend payouts. Mind boggling, isn't it? It's a fact! Company has posted strong growth YoY and rewarded share holders in big way, Company was trading at Rs. 3 (bonus / split adjusted price) with market cap of merely 13 crores in Jan 2009, today market cap of the company is 2062 crores. Company is a market leader in the industry it operates, artificial leather industry offers great growth potential considering huge untapped market and its well accepted replacement products to original leather products. Company was in expansion spree with continuous rise in demand for its products and was distributing healthy interim dividends. Needless to say, nobody wants to kill animals to use their leather products. With continuous research and development, company offers more than 300 variety of artificial leather to its esteem clients like Ford, Chrysler, Hyundai, Nissan, Tata Motors, Maruti, Mahindra, Bata, Relaxo and many more. We are pleased to share with our readers that 5 Hidden Gems out of 12 released in 2014 have already achieved their target price giving more than 100% returns to our members in period of 6 to 12 months. Hidden Gems stocks - 2014 average returns as on date is 74% compared to small cap index returns of 33.2%, hence outperforming small cap index by 40.8%. Similarly, if we look at performance of Hidden Gems stocks released in first 6 months of 2015, we are glad to share that our Hidden Gems stocks continue to outperform small cap index by wide percentage points. Hidden Gems - 2015 as on date average returns is 48.6% compared to small cap index average returns of 8.1% since beginning of this year, outperforming small cap index by 40.5%. Imp. 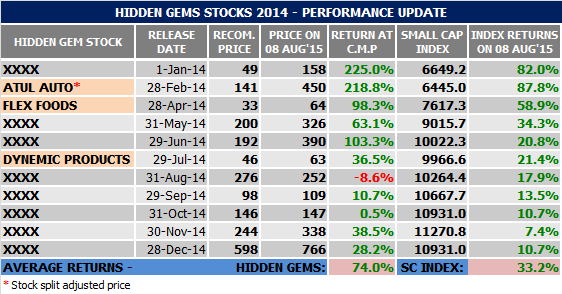 Note: Hidden Gem - July 2015 stock release is delayed and will be released tomorrow on 9th Aug'15.